I have some terrible news: I've recently discovered that there can be such a thing as too much ice cream. My twin discovery, through over-ice-cream-indulgence necessity, is that frozen yoghurt can be just as tasty. And I'm not convinced that there can be such a thing as too much frozen yoghurt in quite the same way. We all know that yoghurt is good for us – scientists, or men in white coats at least, have told us that – but the ice cream companies can only dream of this sort of validation. 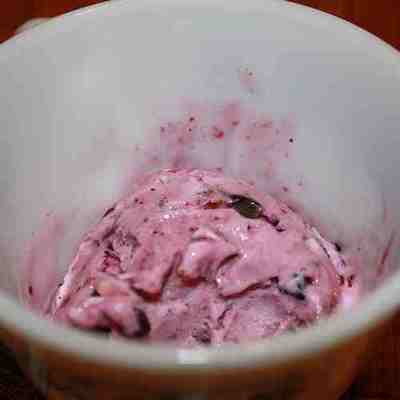 And in its frozen form, yoghurt can quite easily be something akin to a tart yet creamy ice cream. You probably knew all this already, but what you probably didn't know was that frozen yoghurt is actually really easy to make – with or without an ice cream maker. There's hardly anything to this recipe, but the key thing to take care over is selecting your yoghurt. You need a nice thick, creamy yoghurt – Greek style is best and Fage is the classic brand. Most Greek stye yoghurt are classified as 'strained yoghurt' – meaning there's not a lot of liquid to them, but if you can't get thick yoghurt you can strain it yourself, by laying a piece of cheesecloth or muslin over a bowl and placing your yoghurt on top of the cloth and letting the liquid drain off for a period of about six hours. Straining takes out about half of the volume, so if you're using Greek style you only need three cups but if you're using regular then you'll need six cups. Once your have your yoghurt, mix in ¾ of a cup of sugar and one teaspoon of vanilla extract and stir until the sugar has dissolved. Put your mix in the fridge for an hour and then into your ice cream maker and do whatever you need to do to get this little machine to turn your yoghurt into from yoghurt. With an ice cream maker is obviously easier – and it's also the only way to guarantee that there are no tiny shards of icicle in your frozen yoghurt – but if you're not ready to invest in one of these little doozies, then don't get down, here's how to make frogurt without one. Put the blueberries into a saucepan with one tbsp of sugar and two tbsps of water, then bring to the boil and allow to simmer for five minutes. Allow this to cool while you get on with the yoghurty bit. Whisk your eggs and extra yolks, then add the lemon zest, the rest of the sugar and a generous half a cup of yoghurt. Put this mixture into a saucepan and stir it over a low heat for three or four minutes, or until the mixture has thickened. Keep stirring the whole time to stop it from splitting. Remove from the heat and add the remaining yoghurt, lemon juice and the blueberry mix, then stir. Pour into a loaf tin lined with cling film, then cover and freeze for four hours or more. Once your yoghurt is frozen you can take it out of the freezer and cut it into slices to serve.